Well it is that time of year again and my daughter is back in the shop with me to turn Christmas gifts for her teachers and a few family members this year. She has I think a total of 8 projects that she wants to make this year. We started on Friday making pens for her teacher and 1 of her Girl Scout leaders who teaches at the same school so they each get school color Lanyard pens. I am so proud of the progress she has been making. I am still doing an initial start on the blank to knock the edges off, then she is turning it round and getting it very close to the bushings, I have been coming in to get it to the final spot, though I am thinking by the time we are done this year she will be taking it all the way down. 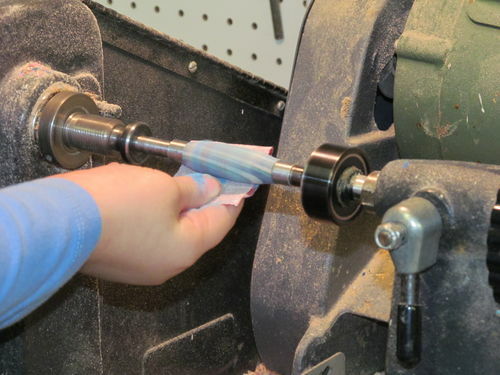 We had a good discussion about the A,B,Cs of turning and she was repeating them each time she started the lathe. We will finish the assembly of these two later this week when we work on some other projects. She has also asked to make an ornament for the ornament swap. So she and I will both be working on our ornaments. :) So more to come before the holidays. Very cool. I wish I could have worked with my kids. 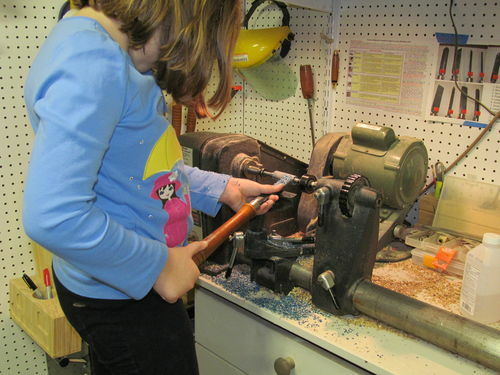 That’s great, I’m looking forward to getting my daughter involved in the shop in a couple years. Keep passing on the skills and spending quality time with your daughter. Looking forward to doing this with my daughter when she’s old enough. Although the lack of a face shield, the long sleeves, and hair not being in a ponytail would make me nervous. That is very cool Chris! I am excited to have my son and daughter there with me at some point doing the same thing! My son helps me now…well more or less asks a ton of questions, while I try to do something, but from time to time, he gets into the mix. He’s working on a box for Nana right now, while I work on some things too. I just think its cool that we can be in there together…sometimes. Then when we are all done and getting ready for bed, I get a huge hug and a “thanks daddy, I had fun with you today.” I am sorry, but you just can’t beat that!